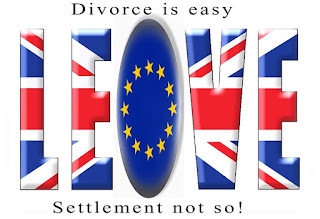 OUFI: Divorce is easy, a settlement not so! 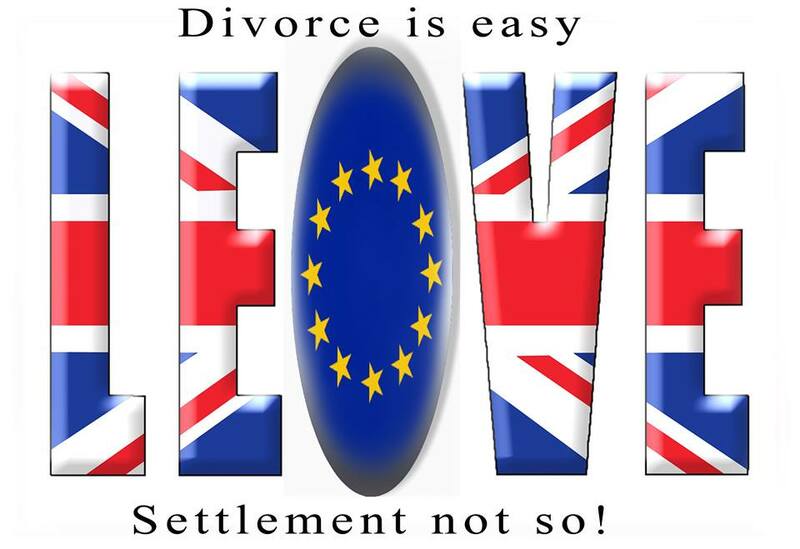 Divorce is easy, a settlement not so! If you thought as is widely known there are no shifting tectonic plates under the British Isles, you would be wrong. On the early hours of Friday 24th of June 2016, the ground shifted with cataclysmic proportions. How far the destructive waves of the resulting tsunami pans out only time can tell. British people or to be precise 52% of those who took part in the Referendum voted to exit from the European Union. After 45 years of marriage albeit rocky at times, Britain is now seeking a divorce from a union that has served it so well. A wound is self-inflicted and unnecessary. To some extent the British government has to apply this instruction but that is the easy bit. To settle the differences with the EU will be harder; sailing through uncharted waters with no radar. There are no precedents and no arbitrary institutions to mediate between the grieving parties. To add to the woes, the new Prime Minister, who would follow Mr. Cameron in October, has to trigger Article 50: a formal notice to leave. He will have foreign relations to grapple with and seismic economic issues as well as the need to calm the inevitable internal strife within the county and turmoil in his or her party. So how did we come to this and what now, Britain? However, since the British public has voted to Exit, this article will challenge such a decision and consider the ramifications on British Economic and socio-political formations. After a gruelling campaign by the Leave, a side called Brexiteers and the Remain camp both giving wild promises and economic gloom and doom and engaging in scaremongering the British people voted 52% to Leave and 48% to Remain in the European Union. Both sides used alarmist language bordering on the mythical if not downright lies. The Brexiteer leadership promised to “take back control” including Sovereignty and restrict the flow of immigrants pledging to save £350billion to reinvest in the NHS rather than net outflow contribution to the EU. The remain claimed every family will be worse off by £4000 if Britain leaves. Also, many other claims that are hard to say or predict but mainly based on misuse of statistics. The important thing is that the electorate has made a decision and what we now have to consider is whether that decision is legally binding on the British Government and what are the likely consequences for Britain, Europe and indeed for the rest of the world. Also to note The Three Musketeers, Boris Johson, Michael Gove and Nigel Farage leaders of the Brexit campaign had not even considered ‘the afters strategies’; how to tackle the exiting aftermath. No doubt the fallout will be tremendous but as in all these things, one has to gather the remnants, limit the damages and go forward the best way possible. The internal political implications are immense and judging by the pacifying nature contributed from the politicians of all colours the priority is uniting the country once more. The starting question, however, is whether the Referendum is binding on the government. The simple answer is a decisive NO, but merely advisory. Moreover, its principle and verdict although democratic its substance leave reason to doubt. Whether the acceptance of this Will ground on moral or constitutional judgment is far from clear at this stage. Indeed, there is doubt whether the Article 50 of the Lisbon Treaty has ever been ratified therefore invoking it remains baseless. Grounded on vague assumptions on how a country can leave the EU as in the happy moment of entry; exit then was not seriously contemplated. Complications may also arise when warding off other members from a possible Leaving contagion in efforts to protect the Union. It is also important, in the turmoil of inevitable haggling over interpretation, of terms or inferences members needed to guard away from adversarial stances. What could it mean for Britain? Tom Short of the Guardian Newspaper, rightly point to; “Sterling, Scotland, the Irish border, the Gibraltar border, the frontier at Calais, the need to continue compliance with all EU regulations for a free market. The re-issuing of passports, Brits abroad, EU citizens in Britain, the mountain of legislation to be torn up and rewritten” no doubt there will be much more to add in the days and weeks ahead. Faced with 62% of the electorate who did not vote to leave leaving 38% who did is not a mandate to exit the EU. By many expert accounts the Exit poll more than suggests a populist motion of censure with the establishment, with David Cameron as Prime Minister, and for the older generation, embroidered more by nostalgia than hard facts. Whether there is a legal mechanism to renounce the referendum must be left to the lawyers and QC’s to arbitrate over. Economically the victory by the Exit camp may be pyrrhic and the costs to the unity of the United Kingdom that has withstood wars and upheavals of many kinds since its inception in The Act of Union 1707 is likely to disintegrate. Nicola Sturgeon, Scotland First Minister, has already advocated a possible “new referendum on the table” further adding that that “Holyrood could try to block the UK's exit from the EU.” The Northern Ireland question seems to have woken up from its slumber where we may surprisingly have unfinished business. The fear will be the Republicans wanting to renew their cause re advocating old grievances that could draw us all back to the violent late 1960’s and 1970’s the height of religious conflicts. There is also the proverbial Gibraltar question, its relation with Spain and its economy’s dependence worker flow from Spanish mainland; vital to the well being of the locals who voted overwhelmingly to stay in the EU. Within 24 hours of the exit vote, Spain has requested joint running of Gibralter’s affairs. The enormity of the costs of economic consequences can not be underestimated. Britain, as a highly industrialised nation imports over 60% of its food it is very sensitive to a sterling drop in value. Aside from holidays abroad becoming more expensive this can easily result in the rise of food costs which will inevitably put pressure on high street consumer prices. Such volatility may indeed lead to market instability exerting pressure on wages and inflation. The Exit action will also have a sour relationship with EU 550 million consumer-rich none tariff single market. Its leadership will be free to exercise their protectionist policies make it difficult for foreign owned producing plants to base their manufacturing in the UK. The probable scenario will see Head offices and factories and jobs uprooted which will, at least in the short term have an inexorable pressure on property prices as I see it. Although the Stock Market has somewhat stabilised from its ills of last Black Friday, June 2nd, it nevertheless emphasis is weighted on the negativity that the international community associated with the Exit vote. Immigration became another self-realising prophecy despite there is not enough substance to justify it but used as an alarmist argument. Some sections of the public took this as licentious rants for racial abuse. Lord Mandelson, who says “they [Voting Public], were exploited by the Leave campaign's relentless focus on immigration.” Also, Krishnan Guru-Murthy of Channel 4, asked Farage leader of the Ukip party"How many of those people in the poster made it to Britain? None." Found no response. Other than political divisiveness this marked an escalation of ‘white man’ to ‘come out of the closet’. Such deep scars need healing which will undoubtedly prove more troublesome to plaster over than mere differences of opinion. Considerations to the above must highlight the importance to review this costly vote or indeed since there is so much doubt on its legal entity enough to reconsider. If it is not binding, Parliament must revoke it or from the perspective of percentage figures I have quoted above not to ratify it. Indeed invalidate reasons to invoke Article 50 as well. To see the vote for what it is; anti-establishment, populist derived more from demagoguery that logic or rational argument and above all from gut feeling rather than common sense. It is imperative over all parties, Whitehall, Berlin, and Paris to calm down, if not negate the vote to delay the process of intent on article 50 and to renegotiate with the European Union. If reform needs to go to the roots of the Brussels to redefine their relationship to reach new agreements then so be it. Europe is for Europeans. Inevitably this will mean compromise and linear duality taking under its wings zero sum directives as with all negotiations.